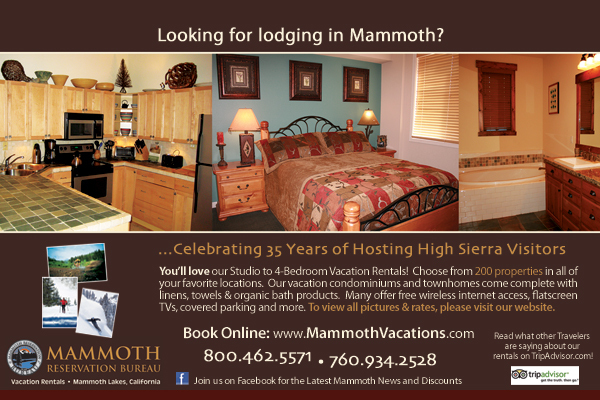 The present resort town of Mammoth Lakes is situated near the now quiet Lake Mining District. The district was established in 1877 when a group of miners discovered the gold and silver deposit that became known as the "Mammoth Lode." By 1878 a twenty stamp mill was operating and the towns of Mammoth City, Mill City and Pine City rapidly developed. What remains today is a series of rock foundations and a flume that supplied water to the Knight water wheel. Used to power the stamp mill, this famous, six-foot water wheel was fabricated in Europe and shipped around Cape Horn. A small monument commemorates Mill City townsite. A ranger-led tour of Mammoth City and Mill City is offered during the summer. 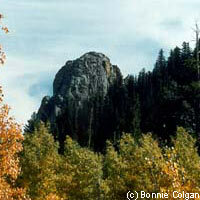 Contact the Mammoth Ranger Station for dates and times. For mining history buffs, the nearby Mammoth Consolidated Mine, established in 1927, is also worth visiting. You'll see remains of the mine's bunkhouses, cookhouse, manager's office, assayer's office, ore processing equipment, the mine adit, and the ore transportation system. When the mine is open you can go inside but you will need good flashlights, and shoes that can get wet. The brochure for the self-guided walking tour of the Mammoth Consolidated Mine is available at the Mammoth Ranger Station. The Mammoth City point of interest is just south of Coldwater Campground. The mine entrance is located at the rear of Coldwater Campground. To reach the campground, take Highway 395 to Highway 203 to the town of Mammoth Lakes. Coldwater campground is located just outside of town; Mammoth Consolidated Gold Mine is off the uppermost parking lot of the campground. There is a well-marked, 0.25-mile trail off the Duck Pass Trailhead parking area, located just south of the Mammoth City point of interest. No facilities are available at the mine, however wheelchair restrooms are at the trailhead.